World Environment Day on June 5 was marked in various ways throughout the country and in Mt Hagen, the day was marked with a clean-a-thon in the city. Youths from the Mt Hagen branch of the West Enga Foundation, a Non-Government Organisation based in Port Moresby commemorated the day on 12th June by leading the public to clean up the city under the theme, “clean homes – clean lives”. Prior to the clean-up,, the foundation had written to business houses, government agencies, churches and individuals asking them to donate hand gloves, disposable plastic bags and dump trucks or open back trucks and utilities to help collect the rubbish and dump them. The Western Highlands Provincial Health Authority (WHPHA) was one of those that had been approached to donate such items. In response, the Authority donated boxes of disposable rubber gloves and plastic bags – the items it uses most to clean up the Mt Hagen Hospital campus, to help them collect the rubbish in the city. The Authority’s Acting Director Corporate Services, Yasi Anuma when handing over the items said the organization was pleased to make the donation as it was one way of showing its support for the cleanliness of the city and the environment we live in. 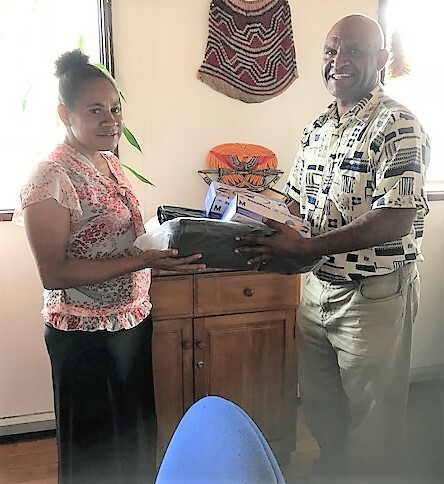 A female representative of the Foundation is pictured receiving the disposable plastic bags from Acting Director Corporate Services, Yasi Anuma.